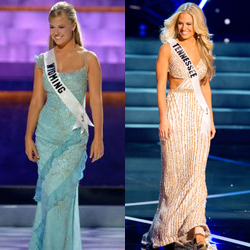 This page details the Miss Teen USA 2005 state titleholders who have competed at Miss USA or competed in Miss USA state pageants. 2005 has had the fewest number of returning teens in the recent history of the pageants, with only 16 returning to compete in Miss. Close to a third were successful, with five competing at Miss USA. Brittany Toll (NM) is one only a few who have placed at both Miss and Teen USA.